Real Tennis, the sport of kings–circa 700 years ago. Before there was tennis as we know it, there was a game called Real Tennis, the original racket sport from which the modern game of tennis is derived. 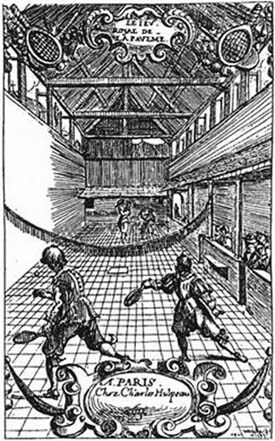 Real Tennis, coined the Sport of Kings, started in England in the 1400’s. The game was played inside on an oval court with balls that didn’t bounce, weird rackets and a scoring system and rules that would confound any serious student of the game. But they did use some sort of ball. 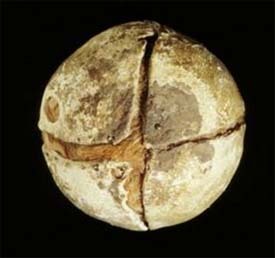 The original balls: stuffed with wool or cork, wound with fabric or animal intestines, covered in woolen cloth or leather. In England in 1463, Parliament passed an act banning the importation of tennis balls, as well as playing cards, and dice, which hurt the game significantly. Across the channel in 1480, Louis XI of France, a tennis buff himself, forbade the filling of tennis balls with chalk, sand, sawdust or earth and sand. He said the balls needed to be made of good leather and well stuffed with wool. He didn’t want them stuffing them with animal intestines either. Centuries later, some balls recovered on the roof of Westminster Hall in London, during a period of restoration in the 1920’s , found old balls made of putty and human hair, possibly cultivated from the French they guillotined in the town square. 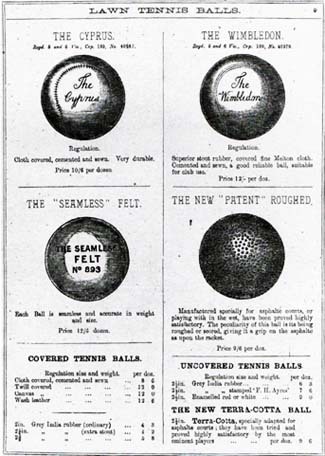 The first proto-modern balls: vulcanized, air-filled, with and without cloth coverings. The first significant change in the tennis ball came in the 1870s in England when lawn tennis began to replace real tennis as the game. Walter Clopton Wingfield, a Welsh inventor, who was one of the pioneers of lawn tennis along with Augurio Perera and Harry Gem, began to import rubber balls from Germany where the Germans had been successful in creating vulcanized air-filled balls. These were light and grey or red in color and had no covering. Then John Moyer Heathcote, an English barrister and real tennis player, suggested covering the rubber ball with flannel. By 1882 Wingfield began advertising his balls as clad in stout cloth. This was the beginning of the balls we know today. After Japan bombed Pearl Harbor, the entire tennis market was affected. Because 90% of the rubber being cultivated was going to war priorities, this put an end to the manufacturing of tennis balls. Tennis players would go into tennis stores and buy them out in fear there would be no balls on the market. 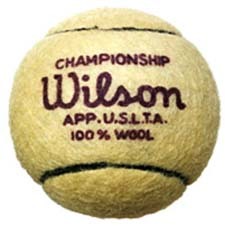 The Wilson Victory ball made of reclaimed rubber, used during WW II. There was a good back-stock of balls, but all the ball brands went into R&D looking for ways of creating balls that didn’t need crude rubber. Out of this came the “Victory” ball made of reclaimed rubber with black seams, although its bounce height was about 6 inches lower than traditional balls. The Pennsylvania ball company also made balls from recycled rubber and, in a big step in the history of the game, was the first company to sell balls in pressured cans. The modern ball has gone through its own evolution especially when it comes to the packaging and the cans, and of course, changing the traditional white balls to optic yellow in 1972 so the TV audience could better see the ball. Penn balls: the first sold in pressurized cans. 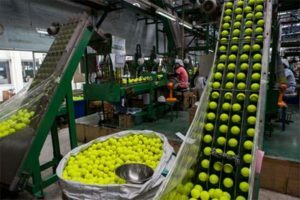 Interestingly, because of International Tennis Federation regulations, the making of the tennis ball hasn’t changed much in years and most of the factories are the Far East. Outside of Bangkok, Wilson’s 118,403 square foot factory turns out a 100 million of the yellow-green furry things every year, using a process that involves 24 intricate steps. Chris Clark, the Global Product Manager for Wilson Racquet Sports said that the difference with the balls both for Wilson and the other companies is the manipulation of the felt on the ball. The Wilson factory in Bangkok turns out 100 million balls a year. Strangely, modern tennis balls have made an appearance on the political scene. In one of the oddest edicts came from the city of Cleveland during the 2016 Republican convention when they banned at least 72 kinds of weapons and gadgets from the 1.7 square mile “event zone”. Guns were allowed, as it’s an open carry state but not tennis balls. Tennis balls were deemed more dangerous than carrying a gun. 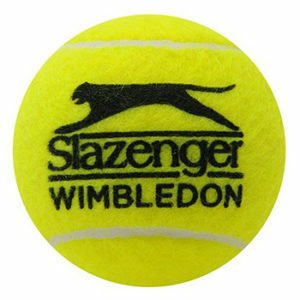 On a more serious note, Wimbledon was called out this year as it was revealed that the beloved Slazenger tennis ball used at The Championships were made in a sweltering factory in the Philippines. The workers were making pennies on the hour, far less than the allowance the ball boys and girls get for handling them on the Wimbledon grass. Further down the supply line, the rubber workers supplying the rubber for the shells of the balls earn less and are forced to cultivate the rubber from Basilan, a dangerous Island that is terrorized by the Islamic State. The Wimbledon ball: from sweltering factory to cool grass lawns. Tennis balls continue to be the great equalizer as they are used at every level of the game and with the advent of youth tennis; they now come in different sizes. The bigger foam balls and the various depressurized balls used by young aspiring players are intended to grow the game of by helping players become more skilled at earlier levels. At the club and USTA level, the balls often become a point of conflict. Who brings the balls, who opens the balls and when, and what kind of balls does a particular player want to play with? Dunlops are harder, Penn’s fluff up more and what about the many kinds of balls offered by any one company? And then there is that Federer ball that is more expensive than any of the others. Rich Francey, Director of Sales for Tennis Warehouse says “I don’t see any significant changes in ball technology in the future and I don’t see manufacturers doing anything to increase the life of the ball.” Francey went on to say that tennis ball prices have not increased in the last twenty years in the U.S. but in Europe they sell for as much as $12.00 a can. 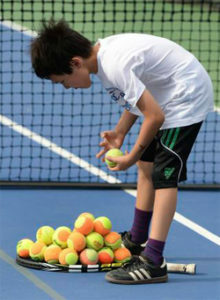 A big change in junior tennis – depressurized, lower bouncing balls. The relationship with the player and the tennis ball can be a complicated one. Players like Novak Djokovic are so mesmerized by the ball that they will bounce it dozens of times before actually striking it. His bounce record is 39 times in a 2007 Davis Cup match against Australia. Former U.S. #1 and 1959 Wimbledon semi-finalist Sally Moore, who always had a positive outlook on the game, stated that she loved tennis balls and believed because of that love the balls would be good to her in her matches. 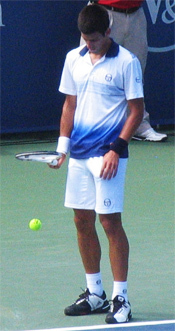 Djokovic once bounced a ball 39 times before a serve. Dominika Cibulkova appears to kiss newly opened tennis balls. She denies that and said instead, “I smell them, I love their smell, the smell of new balls.” The Slovakian claimed that she could smell a ball and know which tournament it came from. At the 2017 Wimbledon Championships, Dominik was blindfolded and then correctly matched each ball by smelling it to the tournament it was originally used in. Other tennis players seem to hate tennis balls so much that they will hit them out of the stadium. Players often curse at the ball and call it names. Canadian player Denis Shapovalov hit a ball that nearly took off the head off chair umpire Arnaud Gabas and fractured his eye socket. Tennis balls have become ever-present in our world today. They are used on the bottoms of walkers, as throw toys for dogs, doorstoppers and even reconstituted carpets made from repurposed rubber. 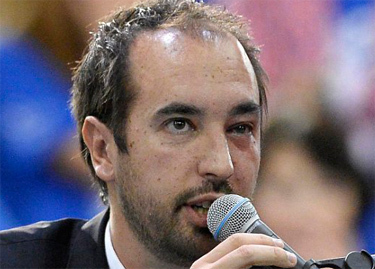 Denis Shapovalov fractured the eye socket of chair umpire Arnaud Gabas. In the United States alone 125 million tennis balls are sold each year and 325 million worldwide. Sadly over 100 million balls are dumped into landfills each year and will take over 450 years to decompose. So the next time you decide to hit a ball over the fence remember, it will likely be there long after you’re gone. Finally, the great Billie Jean King finds spiritual meaning in the tennis ball. She said, “I love the smell of the ball and the sound of the ball hitting the strings. The seam on the ball reminds me of the separation between the land and the ocean on earth.” That is deep thinking. Why Senior Tennis Matters to the Rest of Us Is the Underhand Serve Underhanded?